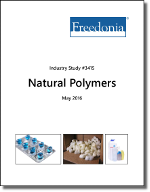 US demand for natural polymers is forecast to expand at a 4.3 percent annual pace to $5.1 billion in 2020, reaching 1.9 billion pounds. Growth will be driven by demand for natural ingredients in the large food and beverage industry, which will bolster use of cellulose ethers and starch and fermentation polymers. Most product types will benefit from strong demand from the medical market, as natural polymers are used extensively in pharmaceuticals, wound care, and orthopedic injections. Companies mentioned include CP Kelco (JM Huber), Ashland, Dow Chemical, Cargill, FMC, and Solvay.